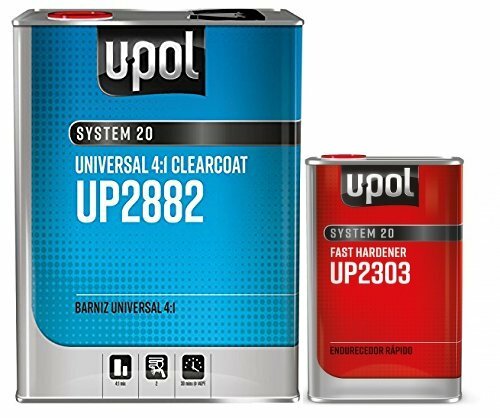 U-Pol 2882 FAST KIT U-POL Overall Clear URETHANE CLEARCOAT UNIVERSAL CLEAR 4:1 FAST KIT EUROPEAN STYLE CLEARCOAT w/NANOPARTICULATE TECHNOLOGY by U-Pol at Beaver County Collision. MPN: 2882. Hurry! Limited time offer. Offer valid only while supplies last. View More In Clear Coats. Fast Hardener. Hardens rapidly to give a high build U.V resistant coating. If you have any questions about this product by U-Pol, contact us by completing and submitting the form below. If you are looking for a specif part number, please include it with your message.